Confirmation - What an Amazing Week! We shared a special Reconciliation at the Church with Fr. Ian in which we could share our feelings about Confirmation. We enjoyed a wonderful Retreat with Mrs Sue Barton in which the children were asked to liken themselves to wind and fire, complete a crossword on the Pentecost story, challenge their knowledge of Patron Saints and create sculptures depicting the fruits and gifts of the Holy Spirit. I have also set some tasks on Mathletics for the students to try to review our current work on angles. Reading – 10-15 minute. Write in their diary and have it signed. This term has been such a busy one with so much learning happening! Here is a little of what we have been up to in our Literacy time. 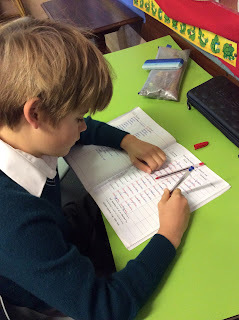 Spelling - This term we have been looking at our individual Phonic Concept focus. We are looking at the way that the word looks through our Word Pyramids, We are learning about what the word means through understanding its definition. We are being creative with the words that can appear within our list word and we are also looking at Synonyms and Antonyms for our list words. What the word sounds like?What the word looks like?How the word changes by adding prefixes and suffixes after identifying the base word.The origins of our list words.